Marketing optimization takes data about customers, offers and channels – factors in business objectives and constraints – and identifies the marketing actions which will deliver the best overall returns. With this information, marketers can plan and prioritize campaigns to maximize success in terms of customer impact, operational efficiency and financial outcomes. 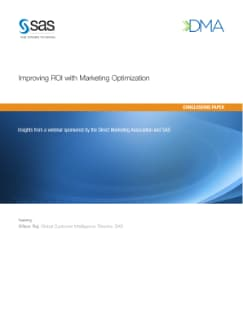 This white paper summarizes a webinar co-sponsored by DMA and SAS that demonstrated how mathematical optimization delivers on this promise while setting the stage for an integrated marketing management (IMM) approach.